The role of the practitioner, as well as being incredibly important, is also inordinately complex. We work in an environment and a profession that is simultaneously challenging on a multitude of levels. all the time and understanding the process of this and the importance of what happens and how, cannot be underestimated. As well as CPD, which consists of ‘receiving’ information, it is also vital to understand how this is used and applied, and how this becomes ‘owned’ by the professional. Reading books, articles and blogs gives us the opportunity to gain a different perspective on pedagogy, or access to unknown information that can enrich what we do. 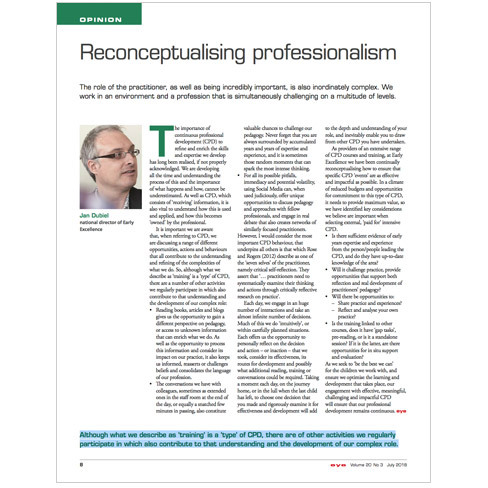 As well as the opportunity to process this information and consider its impact on our practice, it also keeps us informed, reasserts or challenges beliefs and consolidates the language of our profession. The conversations we have with colleagues, sometimes as extended ones in the staff room at the end of the day, or equally a snatched few minutes in passing, also constitute valuable chances to challenge our pedagogy. Never forget that you are always surrounded by accumulated years and years of expertise and experience, and it is sometimes those random moments that can spark the most intense thinking. For all its possible pitfalls, immediacy and potential volatility, using Social Media can, when used judiciously, offer unique opportunities to discuss pedagogy and approaches with fellow professionals, and engage in real debate that also creates networks of similarly focused practitioners. However, I would consider the most important CPD behaviour, that underpins all others is that which Rose and Rogers (2012) describe as one of the ‘seven selves’ of the practitioner, namely critical self-reflection. They assert that ‘… practitioners need to systematically examine their thinking and actions through critically reflective research on practice’. Each day, we engage in an huge number of interactions and take an almost infinite number of decisions. Much of this we do ‘intuitively’, or within carefully planned situations. Each offers us the opportunity to personally reflect on the decision and action – or inaction – that we took, consider its effectiveness, its routes for development and possibly what additional reading, training or conversations could be required. Taking a moment each day, on the journey home, or in the lull when the last child has left, to choose one decision that you made and rigorously examine it for effectiveness and development will add to the depth and understanding of your role, and inevitably enable you to draw from other CPD you have undertaken. As providers of an extensive range of CPD courses and training, at Early Excellence we have been continually reconceptualising how to ensure that specific CPD ‘events’ are as effective and impactful as possible. In a climate of reduced budgets and opportunities for commitment to this type of CPD, it needs to provide maximum value, so we have identified key considerations we believe are important when selecting external, ‘paid for’ intensive CPD. • Is there sufficient evidence of early years expertise and experience from the person/people leading the CPD, and do they have up-to-date knowledge of the area? • Will it challenge practice, provide opportunities that support both reflection and real development of practitioners’ pedagogy? – Share practice and experiences? – Reflect and analyse your own practice? • Is the training linked to other courses, does it have ‘gap tasks’, pre-reading, or is it a standalone session? If it is the latter, are there opportunities for in situ support and evaluation? As we seek to ‘be the best we can’ for the children we work with, and ensure we optimise the learning and development that takes place, our engagement with effective, meaningful, challenging and impactful CPD will ensure that our professional development remains continuous. Although what we describe as ‘training’ is a ‘type’ of CPD, there are of other activities we regularly participate in which also contribute to that understanding and the development of our complex role.